Learn more about the world leader in instant file recovery with up-to-the-minute protection in this short, animated video. Join the virtualization experts from Condusiv Technologies with over 30 years of I/O optimization expertise on February 6th for a complimentary webinar to learn more about how this solution can help you boost Virtual Machine (VM) performance without adding any new hardware. Spencer Allingham gives a sneak peek of the NEW Undelete 11, the world's leading recycle bin. Spencer Allingham teams up with MSSQL Tips to bring you a webcast on the true cost of building really fast SQL server VMs. Spencer Allingham put together video tutorials to walk you through a POC of V-locity I/O reduction software. Spencer Allingham shows you how V-locity can help you acheive better performance on your servers and other databases. Spencer Allingham explains how to squeeze several thousand more IOs per Second from your NVMe, flash or SSD storage. Condusiv I/O reduction software guarantees to solve performance issues on Windows servers. Visit www.condusiv.com/try to evaluate. In this whiteboard video, Brian Morin shows you how an I/O Reduction software can guarantee to solve the toughest performance problems. In this video, ActualTech Media’s David Davis interviews Condusiv’s Senior VP Sales and Marketing, Brian Morin to learn how V-locity can help overcome performance problems in virtual environments to greatly improve performance. In this ChalkTalk video Storage Switzerland’s lead analyst George Crump and Condusiv’s Senior Vice President of Marketing, Brian Morin discuss how Window’s inefficiency makes the I/O blender worse and how to fix it. Hear about the two big silent killers of SQL performance and why your heaviest workloads are only processing HALF the throughput they should from VM to storage, no matter how much flash is thrown at the problem. Well-known consultant and analyst Marc Staimer, Dragon Slayer Consulting, discusses the gap between the I/O growth rate vs. gains in infrastructure to handle it. Hear more from Marc about the I/O performance gap, the inability of hardware to keep up, and how V-locity offers an efficient software approach to solving the I/O problem. Leading analysts from Taneja Group present Why Hardware for VM Performance Should be Your 2nd Option. In this webinar, learn about V-locity—a software-only performance solution guaranteed to meet and exceed your application SLAs. In the first of 4 V-locity 6 training videos, you will learn about the installation and configuration of the V-locity Management Console which enables seamless deployment and centralized management of V-locity. In the second of 4 V-locity 6 training videos, learn about the deployment of V-locity and Licensing with a central command and control that makes deploying V-locity fast and non-disruptive. In the third of 4 V-locity 6 training videos, learn about V-locity configuration and setting up alerts. In the final V-locity training video, learn about the new "I/O time saved" dashboard in V-locity 6.2 that shows not just how much read and write I/O traffic is offloaded from storage but how much time is saved as a result. Also, learn about other new reporting features like hour-by-hour analytics. In the latest StorageSwiss.com ChalkTalk video we explain why fragmentation is still an issue, even when the volume is on a SAN, and we will provide some ideas on how to solve that problem. Truth in IT presents “Frequently Unasked Questions,” highlighting V-locity software and how it increases application and storage performance while controlling the data center footprint. 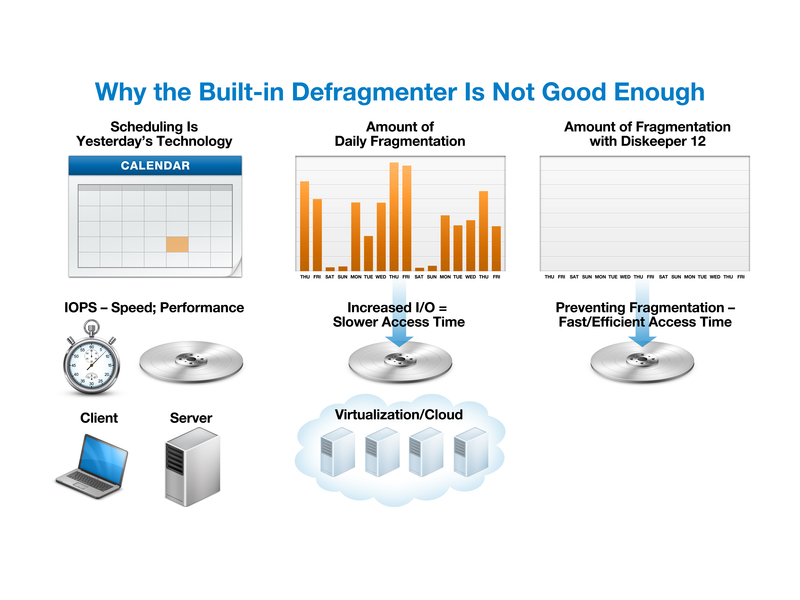 Learn why the Built-in Defrag in Windows 7, 8 and Server 2012 is not good enough. This "Quick take" video demonstrates how running the built-in defrag after the fact, doesn't address the real problem. Learn how Diskeeper uses prevention to help customers proactively address the issue of fragmentation with astounding results. View Defrag Diagram. Learn how files are written to a storage device in the Windows file system and why these files create unnecessary I/O requests. This "Quick take" video explores how Diskeeper and V-locity allows you reduce these I/O requests, allowing the underlying storage performance to become increasingly more efficient. View I/O Request Diagram featured in this video. Learn why it's important to optimize file systems in virtual environments. This "Quick take" video explains how V-locity can be used to optimize your files, reduce your I/O activity, speed up your application and file access times, and increase your overall virtual environment efficiencies. View the I/O Traffic Diagram for virtual environments featured in this video. 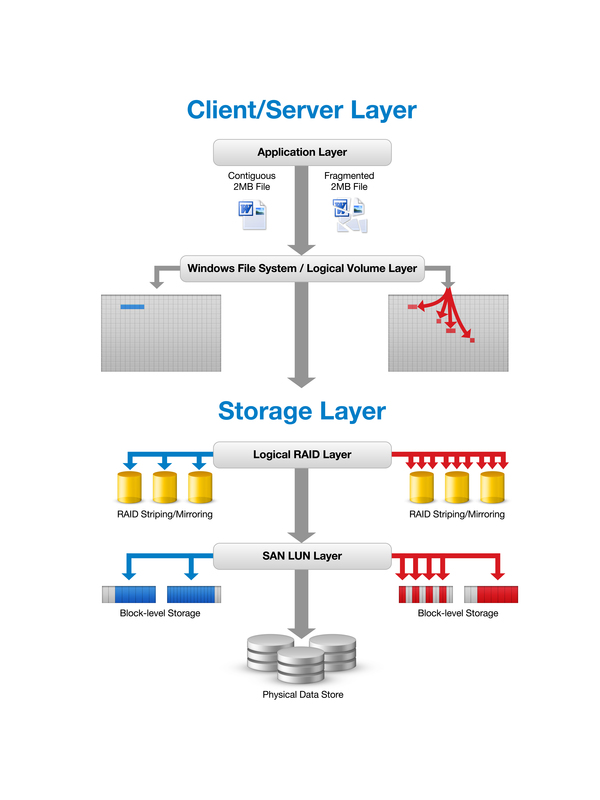 Learn how to optimize SAN tiered storage to get the maximum throughput possible. This "Quick take" video explores how V-locity virtual disk optimizer gives you more throughput, greater levels of efficiency and better utilization of your SAN tiered storage, all with no added overhead. 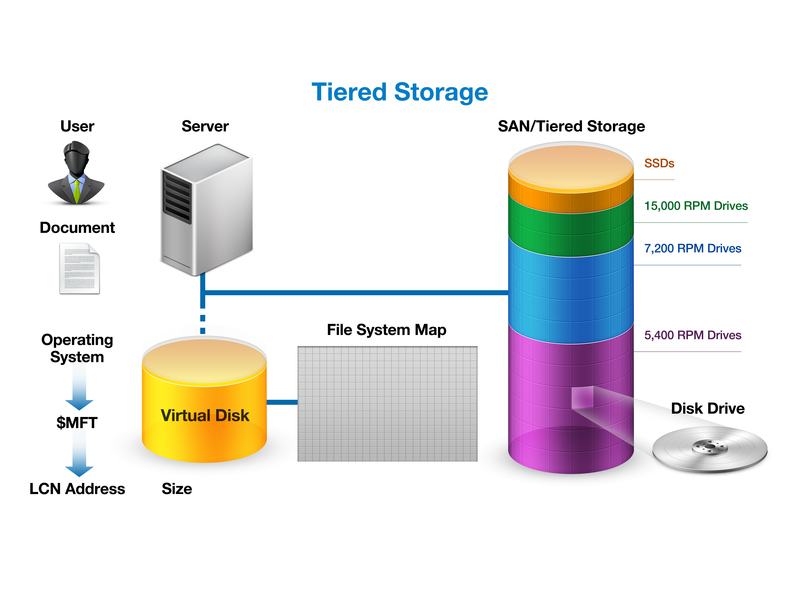 View SAN Tiered Storage diagram featured in this video. 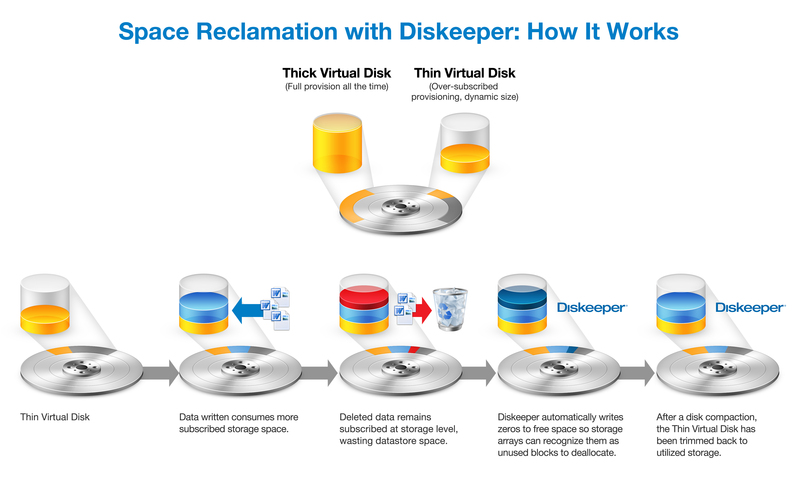 Maximize the use of your disk storage through space reclamation by using Diskeeper performance software. With this "Quick take" video, you will learn how you can reclaim disk storage space quickly and easily to get the most out of your existing disk space. View Space Reclamation Diagram featured in this video. Increase the efficiency of your virtual environment through the use of space reclamation. In a thin provisioned environment storage space is better utilized but it does not shrink. 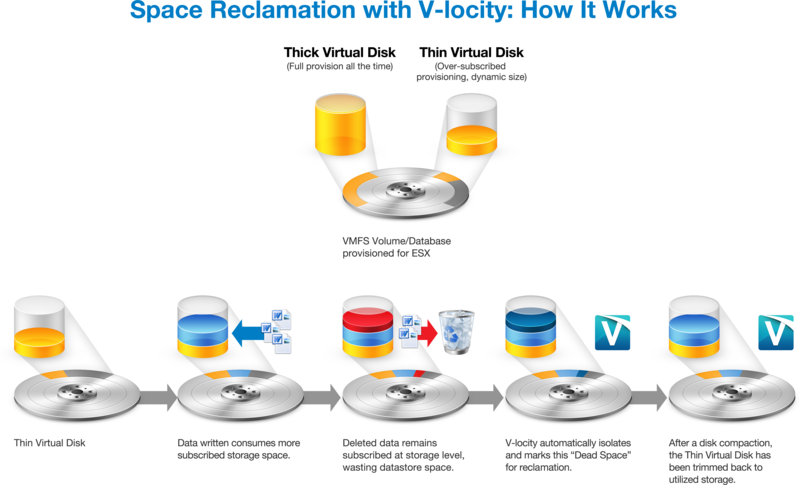 In this "Quick take" video you will learn how V-locity allows you to reclaim your storage space for more efficient use of your virtual machines. View Space Reclamation Diagram featured in this video. Learn how to optimize your physical and virtual servers, laptops, PCs using Diskeeper and V-locity. This "Quick take" video explains how to create a storage performance deployment plan that reduces I/O traffic and prevents fragmentation to ensure optimum system performance across your entire network. View Storage Performance Deployment Plan featured in this video. In business everything changes and nothing moves faster than technology. Learn how Condusiv Technologies can help your company keep pace with the ever-changing world of technology.